With an easy fold to carry on, one handed steering, easy maneuverability and infant car seat attachment this makes travel with a little one a breeze. Full size strollers are often too heavy to drag in and out of trunks much less travel through an airport. Having a more streamlined version that is also a travel system is ideal. You can start using this stroller as soon as your wee one is born with the easy to use strap that attaches to most carseats. Once they hit six months they can benefit from the stroller as is. No need to struggle to get the stroller opened and closed or having no room to store on a trip! Dragging a car seat through the airport can tricky. Plus easy transfer with a sleeping baby! 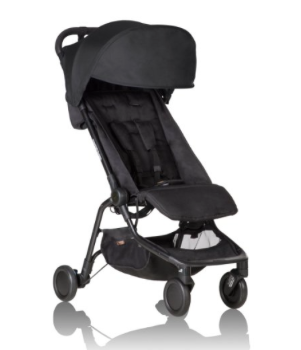 Smaller strollers mean less storage space! Get a hook for bags and use the basket to hold a few essentials. If you like to travel on a plane, keep in mind that checked items will get banged up. You can try and carry on!